Peru can be broadly divided in three biogeographic regions: the arid coastal desert where the 80% of the 26 million people living in the country actually reside, the temperate highlands (Andes) where remnants of the Inkan cutlture persist, and the tropical lowlands on the eastern flank of the Andes which are part of the Amazon basin and an agricultural frontier that is expanding rapidly. In coastal cities, such as Lima, municipal green waste, the material obtained when street trees and vegetation in urban parks are pruned and maintained, is often sent to landfill where it releases potent greenhouse gases (GHGs) such as methane and nitrous oxides. There is scope to utilise this waste stream as a resource because plant biomass has calorific value and could be used as a feedstock for bioenergy production. The diversion of green waste from landfill would also reduce emissions of GHGs from landfill. Equally important, bioenergy produced from green waste could generate biochar as a byproduct. The B4SS strategy in Lima will be to develop and test biochar formulations from municipal green waste that can be combined with currently used fertilisers (livestock manure, seabird guano, synthetic nitrogen fertiliser) to demonstrate the feasibility of converting the by-product from bioenegy production from green waste into a useful and profitable product that may: 1) diffuse some of the cost associated with management of municipal green waste, and 2) increase the use efficiency of already used ferrtilisers. In this context there are promising indications from studies conducted by project partners and led by Prof Stephen Joseph and Prof Lukas van Zwieten in Australia, Germany, Vietnam and China that combining biochar with currently used fertilisers may reduce the reactivity of the nitrogen in the fertilisers, and so extend the useful life of the currently used fetilisers. The production and use of biochar-based fertilisers could also play a key role in natural resource management in the Peruvian Amazon. In the Amazonian highlands (Junin), the yields of cash crops such as coffee are often half the potential yields possible. Rural families in the Peruvian Amazon are the main immigrants from the Andes that fled the Peruvian Andes during the 80s and 90s when the shining path, a maoist guerllia group, was active in Peru. These people arrived in the Amazon as refugees with few resources and their capacity to buy external inputs for agriculture, such as fertiliser, was and remains extremely limited. This has created a vicious cycle where poverty precludes the possibility of investment in soil fertility management (e.g. fertilisers, terracing) which leads to reductions in, or mining of, soil fertility. In turn low soil fertility limits crop yields which maintains income at low levels and may even result in micronutrient deficiencies in the soil that lead to negative health outcomes. The circular relationship between poverty and low soil fertility is a poverty trap that may last generations and this dynamic is readily observed in the Amazon. The viscous feedback cycle between low soil fertility also drives deforestation in the Amazon. Farmers cannot afford fertilisers and so to access soil fertility farmers burn fields, cultivate for 2 or 3 crop cycles and then move to a new location (slash and burn). Over time this strategy has impoverished the soil in the already deforested areas and pressure to extend slash and burn agriculture to currently uncleared primary forest increases continuously. As part of the B4SS project, and in collaboration with Peruvian thesis students, various experiments have been established to identify biochar formulations that poor Amazonian farmers can make from freely and locally available raw materials that will enhance fertility of degraded Amazonian soils. As part of this experimentation, application rates of biochar are also being varied to provide insight into the optimal rates of application. The macro objective is to create a model that could be replicated throughout the Peruvian Amazon that would empower Peru’s rural poor to break the vicous cycle between poverty and low soil fertility. The strategy of own fertiliser production will be a modern version of the strategy that the pre-Columbian indigenous peoples of the Amazon used to manage soil fertility. The readoption of the ancient and indigenous method of fertiliser production that led to the creation of the soils known as “Amazonian Dark Earths” will be promoted. The aim is to provide a model for the people of the region for the production of own biochar-based fertilisers that will potentially: 1) increase the fertility of their existing crop lands without external inputs (which they cannot afford) to break the vicious cycle between poverty and low soil fertility, and 2) increase the productivity of the already deforested areas so that pressure to clear primary forest is reduced. After the most relevant biochar formulations and application rates for the region are identified, the plan is to diffuse knowledge of this strategy for own biochar/fertiliser production in a focal region (Junin). The Peruvian Association to Promote Sustainable Development (APRODES) is an organisation that focusses its actions on improving the situation of disadvantaged populations in order to contribute to the fight against poverty and promote sustainable development. Established in 1996, APRODES has offices in the regions of Junin, Pasco, Cusco, Piura and Lima. It counts with over 50 employees who perform actions for sustainable development and draws resources from the continuous support of international donors, private companies, and public and private institutions. APRODES’ previous projects have generated major benefits for peasant farming families and indigenous communities who need considerable efforts for improving rural livelihoods while at the same time conserving the environmental services that sustain smallholder agriculture. APRODES has partnered with other organisations in Peru that have experience in biochar research and development in order to evaluate a range of biochar formulations and promote them in the project areas. APRODES can make a significant in-kind contribution to all project activities because it has established working relationships with “comedores populares” (i.e. community dining halls) and associations of small scale coffee producers. APRODES also has an established research station in Pichanaki and over 20 years of experience working on extension of new agricultural technologies for small holders in Junin, the focal region of the large-scale field biochar trials with coffee in Peru. A series of baseline projects have been coordinated by Universidad Científica del Sur in Lima and the Peruvian Ministry of Environment. The baseline project ‘Building human capacity and knowledge of biochar in Peru’ focussed on the demonstration and evaluation of biochar production at household level amongst poor peri-urban communities, and capacity building for women researchers, to enable them to evaluate the use of biochar in the Amazon and in the coastal desert region of Peru. The project partners included research and extension staff from the New South Wales Department of Primary Industries (NSW DPI), the University of New South Wales (UNSW), la Universidad Científica del Sur in Lima and the Peruvian Ministry of Environment. Another baseline project is investigating the use of biochar to improve plant growth and water use efficiency in water limited desert soils. 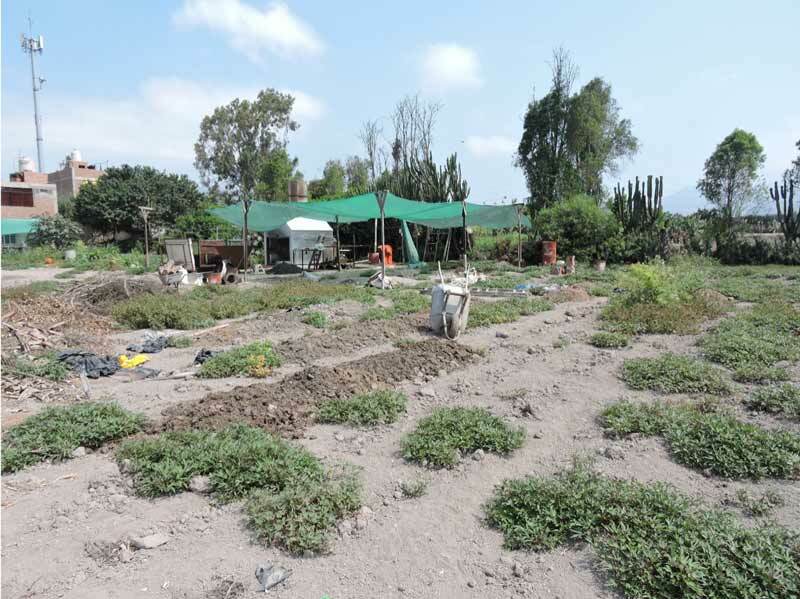 The use of biochar is being demonstrated at the ‘Special Project National Ecological Park Antonio Raimondi (PEPENAR)’, which aims to create 8,259 ha of green space on the poverty stricken northern fringe of Lima. Biochar is being produced from a mixture of municipal green waste, crushed volcanic rock and FE bearing clay and discarded and rusted iron extracted from the city’s waste stream. The Biochar for Sustainable Soils (B4SS) project in Peru is allowing the demonstration and evaluation of biochars that can be produced at household and community levels. It is also allowing for the trialling of more advanced biochar technology that could play a role in green waste management in Peru’s coastal megagcity: Lima. The project is also building capacity in the next generation of Peruvian researchers, enabling them to evaluate the use of biochar in the Amazon (Pichanaki), the Andes (Cusco) and in the coastal desert region of Peru (Lurin). 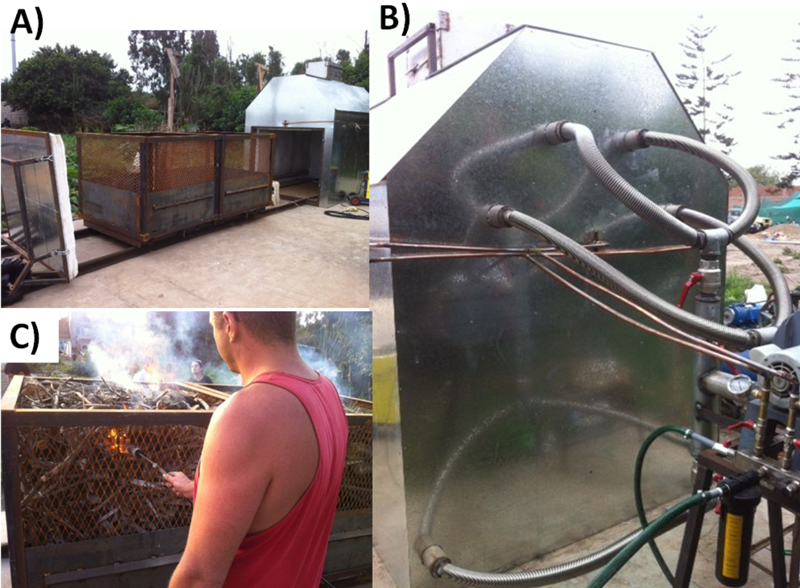 A modern biochar producing oven with the capacity to produce about 100 kg/hr of biochar was constructed in Lima (Figure 1) to facilitate the production of standardised biochars. Figure 1. Biochar producing oven on the final day of construction in Lima (September 2015). A) a side view of the carts that are loaded with municipal green waste for biochar production. Each crate has a capacity of 4 cubic metres. B) An overview of the system for control of air and humidity in the oven during biochar production. C) igniting the feedstock for the first trial of the biochar oven in September 2015. 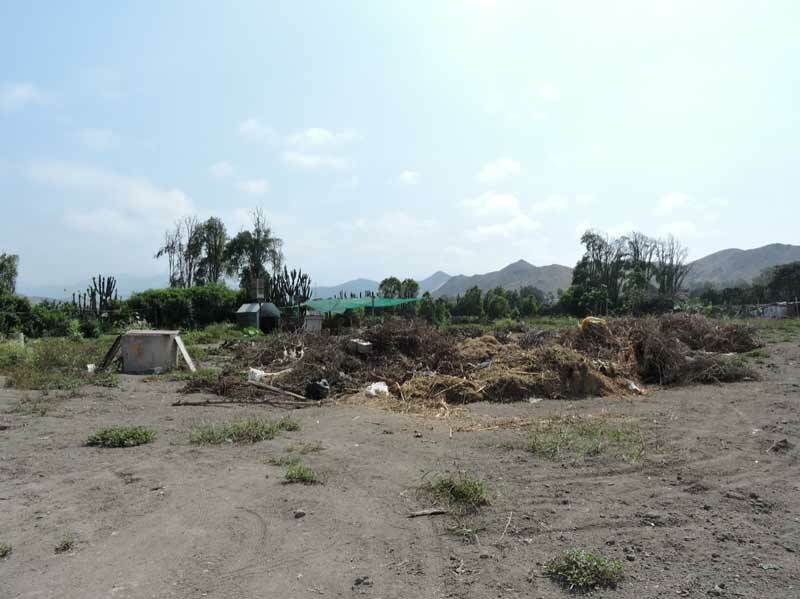 In addition, working relationships with farmers to supply guano (Figure 2) and a local government (Lurin) on the southern fringe of Lima, to secure green waste (Figure 3) for use in experiments, have been established. Figure 2. The pig manure stockpile used for preparing biochar formulations in Lurin Lima. 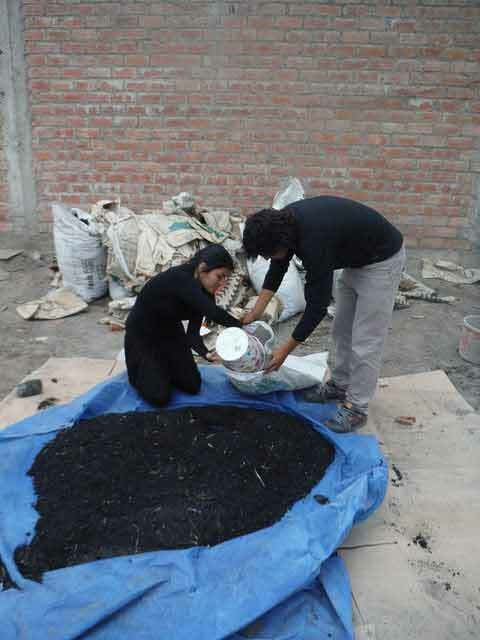 Figure 3: The municipal green waste used for preparing biochar formulations in Lurin, Lima. The work with thesis students has been focused on training in biochar production methods using a range of technologies, from simple to state of the art. Also first experiments led by Peruvian students assessing formulations and application rates of biochar have been established at the group’s principal research site (Lurin) on Lima’s Southern Fringe (Figure 4). The students will conduct a three crop cycle experiment in which the efficiency of fertiliser application with and without biochar will be assessed. The experimental work of Peruvian thesis students assessing biochar formulations and application rates will be replicated in the Andean and Amazonian regions. The results generated by the Peruvian students will be used to calculate the economic value proposition of the respective biochar-based fertilisers. Figure 4. 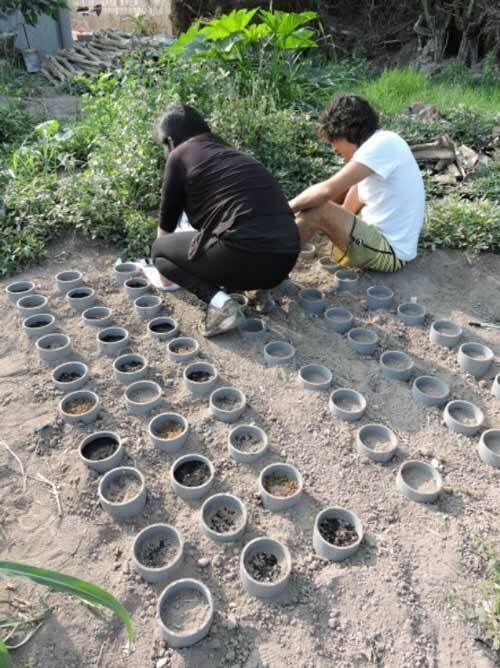 Peruvian thesis students Angie Flores and Mauricio Biker establishing an experiment with radish to test different biochar formulations on plant yield at the group’s principal research site in Lurin. The B4SS project is generating and diffusing knowledge about the potential for biochar to play a key role in the resolution of two important natural resource management challenges facing Peru. Firstly, the project is providing proof of concept that municipal green waste can be converted into a saleable product that could generate revenue and thereby diffuse the costs associated with green waste management in Lima. Secondly, the B4SS project is developing biochar formulations and a strategy that the rural poor can use to produce own biochar-based fertilisers, that will facilitate their own efforts to free themselves from the vicous cycle of poverty and low soil fertility. A number of thesis students is involved in the B4SS project, which is reinforcing the capacity for research in the next generation of natural resource managers and/or researchers in Peru. The results of the B4SS project will be communicated to the wider scientific community via the website and the B4SS good practice guide, and to natural resource managers in Peru through attendance at local workshops, demonstration sites, and through established professional networks in Peru.